We are always trying to figure out ways to eat more healthy, including trying to cook at least one vegetarian meal per week. While Dan was initially not a huge fan of the veggie plan, he is starting to come around, thanks mostly to some delicious vegetarian recipes we have found. This grilled veggie pizza recipe is from Weber’s Big Book of Grilling and contains roasted peppers, sauteed mushrooms and pesto sauce made from arugula. 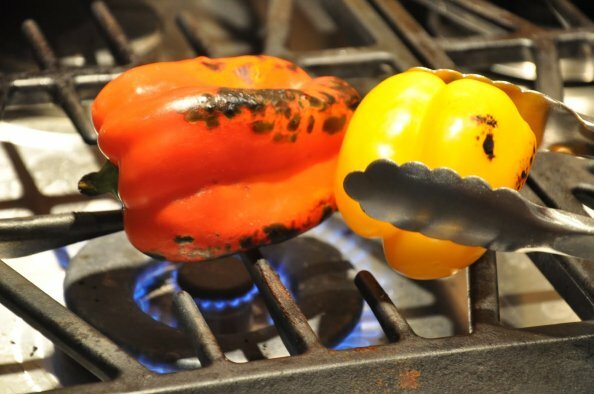 Cook the peppers over the flame of your stove (if you have a gas stove), or on the grill. When they are nicely blackened, put them in a paper bag, close up the top and let them sit for 15 minutes. This will help loosen the skin for peeling them. You could also just buy pre-roasted red peppers, but what fun is that? While the roasted peppers rest, make the pesto sauce for the pizza. Combine arugula, minced garlic, pine nuts, salt and lots of black pepper into a food processor and chop/mix together. Next, drizzle olive oil in through the top while the food processor is still running. The other ingredients for the pizza include the pre-made crust, pesto sauce (with some grated parmesan stirred in after it is processed), fresh arugula, tomatoes, mushrooms and lemon for the big finish. In a skillet, saute sliced mushrooms in a little olive oil, with salt and pepper. After the peppers have rested for about 15 minutes, peel the blackened skin off. Flatten the peppers on a cutting board, use a knife to scrape off the remaining blackened skin, then cut the peppers into strips to place on the pizza. Brush olive oil on one side of the pre-made pizza crust (the side with no cheese, which will ultimately be the bottom side of the finished pizza). We use pre-made pizza crust because we are still looking for a local pizza joint that will sell us fresh pizza dough (a tip we picked up from Dan’s brother Jerry). Ready to move to the grill. The pizza crust will be grilled for a minute or two on one side, then flipped. After flipping, add the pesto sauce, mushrooms and roasted peppers. Because the pizza cooks very quickly on the grill, it’s important to have all your ingredients ready! Pizza on the grill, with olive oil side “up” and the side that will ultimately be the side where you place the toppings against the grill grates. After a minute or two — when the bottom starts to get a little browned — flip the pizza. Spoon the pesto evenly over the pizza. Next, add the mushrooms and roasted peppers, dispersing them evenly all over the pizza. Once the toppings are arranged, cover the grill and cook the pizza another 4-6 minutes, rotating it halfway through so that you get badass grill marks on the bottom. After the pizza comes off the grill, add the fresh arugula, tomato, shaved parmesan and a bit of salt. The final ingredient is a few drops of lemon juice (about 1/2 a lemon total) squeezed all over the pizza. This grilled veggie pizza has bright, fresh flavors and is perfect for a summer evening. It is one of our favorite vegetarian recipes, and one that we haven’t changed much at all from its original version found in the Weber’s Big Book of Grilling. While we’re on the subject of favorites, this book is one of our most-used cookbooks for grilling. 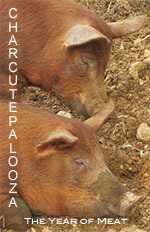 It has tons of great recipes, all with useful explanations and techniques. If you grill more than once every couple of weeks, this is a cookbook you should have in your library. Thanks Patrick! We will definitely check out Jimmy’s Food Store. I think we might have had Cuban sandwiches from there several years ago that were delicious, so your sandwich recommendation is even further incentive to go back. Thanks for the tip!